The pioneering influence that Charlie “Yardbird” Parker made on the world of jazz, blues and bebop in the mid-twentieth century is the most inextricable part of his legacy. Blowing new sounds from his alto saxophone, he crafted a sound so original and so addictive that fans would do anything to “chase the music…just to hear what Bird heard”. Every hall of fame jazzman and jazz singer of the era brought their craft to Birdland, the eponymously named club in the heart of Manhattan, where they could marvel at Parker’s signature technique of playing the higher intervals of a chord for the melody, then backing it up with double- and triple-time extensions. Jazz legends Dizzy Gillespie, John Coltrane, Miles Davis, Count Basie, Duke Ellington, Earl “Fatha” Hines, Stan Getz and Billy Eckstine played the club with Bird in those golden days along with the divine divas, “The First Lady of Jazz” Ella Fitzgerald, Billie “Lady Day” Holiday, Sarah “Sassy” Vaughan and Peggy Lee, each bringing the music to new heights with their unique vocal interpretations. Within the span of a decade Parker brought forth a sound so captivating, so under your skin and bones, that it galvanized American music and helped break down racial barriers as white celebrities from Frank Sinatra to Marilyn Monroe and Beat Generation author, Jack Kerouac, became regular denizens of the iconic club. In the world premiere musical “Ladies Swing the Blues – A Jazz Fable” at MetroStage, Author, Director and Lyricist Thomas W. Jones ll in partnership with Composer, Arranger, Pianist and Musical Director William Knowles, who co-wrote five of the show’s original numbers have, through their divine collaboration, crystallized the essence of that era by portraying both the on-stage and behind-the-scenes lives of Birdland’s leading musicians from those heady days. 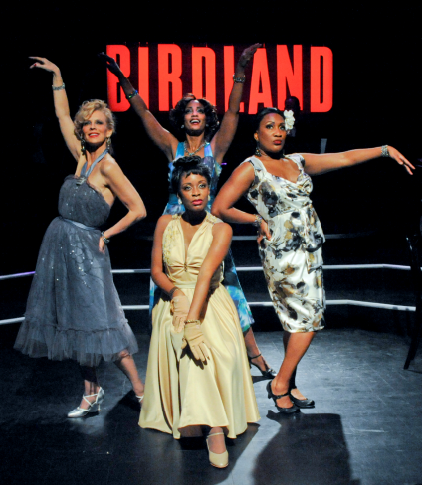 Set in New York City the story features four female singers – Roz White as Lady, Lori Williams as Ella, Yvette Spears as Sassy, Sandy Bainum as Peggy, and Anthony Manough as Parker, better known by the nickname “Bird”, who are backed up by a sizzling hot five-piece band. The story begins with Parker’s untimely but not unpredicted death at the age of thirty at the Stanhope Hotel apartment of his friend the Baroness “Nica”, scion of the Rothschild family. Parker had been living on the edge battling addictions throughout much of his career. He’s got the “junkie monkey” the ladies declare, trying to pinpoint what killed him. “All jazzmen die a mystery,” insists Ella. As his ghost visits the women, they sing his memory through stories and song. If you like classics like Fever, Thelonius Monk’s Round Midnight, George Shearing’s Lullaby of Birdland plus twenty-three more evocative jazz numbers performed up close and personal, this show is for you. If there is mo betta’ singing in one show, I have yet to hear it. The vocals are mad crazy and the band with its ripping solos could uncurl an Afro. To single out any of the performers as less than brilliant would be criminal. But it would be unconscionable not to spotlight Lori Williams, whose scattin’ Ella blew the roof off the theatre, and Anthony Manough’s Bird, whose octave-bending vocal range knows no boundaries. And who used his velvet voice to carve out a piece of the world, which, for all I know, he still owns. At MetroStage through March 17th – 1201 North Royal Street, Alexandria, 22314. For tickets and information visit www.metrostage.org.